A local 24hr emergency locksmith covering the Derby and Nottingham area. Other locksmith services are available on request. No call-out fee. Free security survey - ask for details. As a fully qualified and accredited locksmith I am a member of the National Network of Approved Locksmiths, it is my goal to get you back into your home using non-destructive methods. Security vetted and trained to the highest standards, I strive to make sure that you are satisfied with the services I provide. I can offer other locksmith services, upvc door adjustment, window locks etc so please ask for details. Did a good job & showed us a very pleasant, friendly attitude. Martyn came straight away and changed my 2 lock cylinders so quickly and nicely. He even noticed a faulty with one of my door locks and helped me to correct it without charging me extra. Thank you so much! Was fortunately in my area when I rang and was able to come the same day. He arrived exactly on time and fixed the lock with no fuss or mess. A lovely man, who even noticed my back door didn't shut properly and spent his own time adjusting in for me for free. He was efficient and kind and helpful and I would have no hesitation in recommending him. Very friendly professional service at a fair price. Went beyond expectations by giving advice on how to maintain doors both inside and out. Definitely recommend this company and would not hesitate to use them again. Excellent service from Just-Get-Me-In. Professional and business-like. Would use again & give a recommendation without hesitation. This was a tricky job and took no time to complete. All done to my satisfaction. Thank you! Very pleased with the service received. Also gave us some good security advice. Martyn was very personable from the first contact right through to end of job. He advised me on lock & house safety and did my locks quickly & efficiently. Would use again. This was some work on a security lock at our Church Hall. It was the second time we had used Martyn - and were just as impressed second time round! He visited very promptly, was professional throughout, did the job replacing a digital key pad, and 'went the extra mile' by also readjusting the mortice into which the tongue of the lock slides. Very reasonably priced, too!! Thanks again, Martyn! Excellent service. Martyn arrived very promptly and was in my house within ten minutes. I cannot recommend him highly enough. Arrived within minutes. Problem explained & solved. Costs explain. Lock changed quickly. Excellent service. During our initial 16 min telephone conversation he was happy to give me plenty of information on the possible causes and ways to rectify the problem myself to save me the cost of calling him out. When I could not resolve myself, he came when he said he would do and during the whole process he was showing me what was wrong with the mechanism and what he was doing to rectify it. With someone like this you are paying for his experience and knowledge as well as the job he is actually doing for you. The cleanliness and well laid out van also an indication of someone who quite clearly takes pride in the service he is providing. I will have no hesitation in recommending him to anybody who needs this type of work doing. Very prompt response to phone call - within an hour. Exceptionally pleasant man with a very helpful attitude. Job completed successfully. Martyn tried various ways to free the locking mechanism in order to work out the cheapest way to repair the lock. The workmanship was excellent and all fully explained. Arrived when said, gave me lots of other advice which was appreciated. Very good customer care. Very prompt and efficient with friendly nature and advice. I was very happy with my Trusted Trader. This is the second time I have had him to do jobs for me, my back door and my front door. Thank you. He did a great job, was thorough. Explained things clearly. We would recommend him and be happy to use him again. Martyn provided an excellent service. He responded quickly to our call. He was clean, tidy and a pleasure to deal with. Very friendly, prompt and efficient, repaired my front door lock & explained how it has been damaged. Arrived promptly, work carried out swiftly and efficiently. Everything was explained to us, should the problem occur again, so that we can rectify it ourselves. Called Martyn out for a stuck key in lock early one Saturday. Couple of hours later he came and repaired it. He's very pleasant, chatty person, but the following week the same thing happened again so I called Martyn out again he was repairing my door for 2 hours and he never charged me, he found the problem was my door its ok now. Highly recommend Martyn. Very nice man, who dealt with the problem straight away. Even had to deal with an inquisition from my 6 year old son. Very knowledgeable, helpful and friendly. Wouldn't hesitate to recommend to any friends & family. Came same day as I rang. Very efficient. I would use again if needed. Great service, very prompt and very pleasant! Came very quickly yesterday to fix my front door, and was absolutely Lovely, very fast and reliable! Would absolutely call again if I ever needed help! If you want a job doing well, ask for Martyn. He is excellent. Excellent service. Friendly, efficient and effective. Came out on a Saturday at short notice. Very responsive and good price! Fantastic service. Third time I have used Martyn - can't recommend him enough. Thank you. A very efficient and helpful service. A very knowledgeable and clean worker and a very fair price. Highly recommended. A very considerate and understanding person. He was very professional and polite. A very pleasant polite gentleman who worked extremely efficiently and solved my problem with ease. Very helpful, fast coming to job. Very polite, very satisfactory. Very helpful. Turned up in 10 minutes and gave me some great advice. Service A1, explained in detail A1, Nice chap A1. Would recommend. Was most obliging and helpful, did a fantastic job. Excellent service; prompt & efficient. Highly recommend. Came the next day, fixed the problem with my door lock. Also gave me some advice on security. Martyn went the extra mile not only fixing my door lock but the hinges as well. Martyn responded to my remit for help in under 2 hours. He sorted the problem quickly and efficiently and explained to me what the problem was and how it could be avoided in the future. A first class service all round. Very good service. Very professional. Would definitely recommend. Martyn is a very thorough and efficient tradesman. I would be very happy to use his services again. Thank you again for fixing my locks, would definitely recommend. Martin changed the required lock quickly and efficiently. I was left felling much safer in my home with enhanced security. Martyn arrived punctually and was friendly, informative and very efficient. His charge was very reasonable and I would highly recommend him. Prompt, polite, courtesy. I could not praise Martyn highly enough. Martyn provided a fast response, arrived exactly when he said he would and gave us some brilliant and honest advice about the best thing to do for the house, rather than trying to sell an expensive service. Fitting was fast and mess free. He's a nice bloke as well! Will use again and would highly recommend. Martyn came to our rescue within hours of me phoning him, very knowledgeable and polite. I was very happy with the main who came to mend my patio door lock, it works very well now. He was polite and nice to talk to. I shall have him come again if needed. Martyn Burton came as arranged to sort a minor problem. He did this quickly and efficiently, explaining the process and at a very reasonable price. A good person to know. Reliable, honest and efficient. I would totally recommend Martin and wouldn't hesitate to use him again. A knowledgeable friendly tradesman and one who honours his warranty without quibble. Highly recommended. I rang him at 9am and lock changed and problem sorted by 2pm. Speedy service, very nice man, very good price!! Now put his number in my phone. Will use him again and will recommend him to friends and neighbours. Martyn Burton (J.G.M In) was punctual, effective & charged a fair price. Key broken in back door. Trader came within one hour. Got broken key out and the lock working again. Excellent professional service. I would recommend to anyone in the area. My mother had locked herself out. He arrived promptly and managed to open the front door without changing or damaging the lock. Martyn gave excellent and friendly service. My lock had seized and I couldn't exit the door. He was with me the same day as calling and within the hour as promised. His work was neat and tidy and efficiently carried out. He gave clear explanations at all stages. I would definitely recommend Martyn to others - not just to get you in but to get you out as well! He sorted out the problem quickly and efficiently. Would definitely use again. Same day service, very friendly and polite really helpful and good price.would recommend to others. Excellent job, prompt, polite and very knowledgeable. Would use again without a doubt. Additionally advised on the other door in my house and how to maintain that. Great advice, fair price. Even got recommendations for summer holiday activities! Thanks so much. Very quick to respond to fix new latches, and cleaned any mess created by the work done. First class work and very quick at coming round to do it. Very good price and both done efficiently. Our front door had it's key jammed in the unlocked position - Martyn Burton of Just-Get-Me-In was with us inside twenty minutes (and it was a bank holiday). He was very friendly, helpful and efficient. He will be the first to be called if we have more lock troubles. Very prompt and reliable service. Would recommend to others totally satisfied and could trust as dealing with elderly mother who lives on her own. Excellent advice given regarding options for lock replacement. Very efficient work carried out. A satisfied customer. He answered the phone quickly and came within 15 mins and did a very professional job. Very satisfied. Very quick and helpful, explained what the cost would be and the work that would need doing. Martyn did a terrific job. Not only did he fix the mechanism of my front door so it operated smoothly without sticking, he also realigned the door. It now is draught proof and more secure against intruders. He spent a lot of time on the door, even filing some fittings which could no longer be adjusted, so the door is now a snug fit. Excellent work. I would recommend Mr Burton to anyone. Very impressed with the service my Mum received. Completely understood the issues with dealing with vulnerable elderly customers & carried his work out sensitively. will definitely use again. Again Martyn has solved our problem. He gave us his advice and went out of his way to do a great job. Excellent service - attended property promptly; professional, polite, efficient, highly recommended. Very prompt service, very helpful, gave extra security advice and a very fair price for coming out at the weekend. Super fast, professional, honest and friendly service. Highly recommended. Thank you. Nice guy, honest and reliable. Did a very good job for a fair price. I would highly recommend Martyn. He did a great job. Very efficient, extremely polite and helpful gentleman. Recommended. Prompt, polite, knowledgeable and a lovely tradesman. Thank you. I have used this trader before on a couple of occasions. Always gives a prompt and efficient service for a fair price. Not only was he a very nice person, he made me a coffee - I am not very mobile having returned from hospital after surgery for a broken hip. We had very interesting conversations and he was good company. Excellent service. Very polite, genuine trader. Would recommend to others. Brilliant service, very prompt and Martin was very helpful, I can highly recommend him. Efficient service, especially on a Sunday. Would use again. Great locksmith service, friendly guy! Highly recommended. Arrived at time specified, which was within a couple of hours of initial contact. The original lock, for which I had lost the key, was removed and replaced within 30 minutes of arrival. The level of service was excellent. Martyn is a friendly professional who I will use again if I ever need another replacement lock. Polite and very helpful man. Chatty & friendly. I would definitely recommend him. Very happy with the work to repair my lock. Repaired rather than replaced which was excellent. Friendly, excellent service. I would 100% recommend and feel it was best the decision to use 'Just-get-me-in' and reassured of the Trusted Trader scheme, thanks. 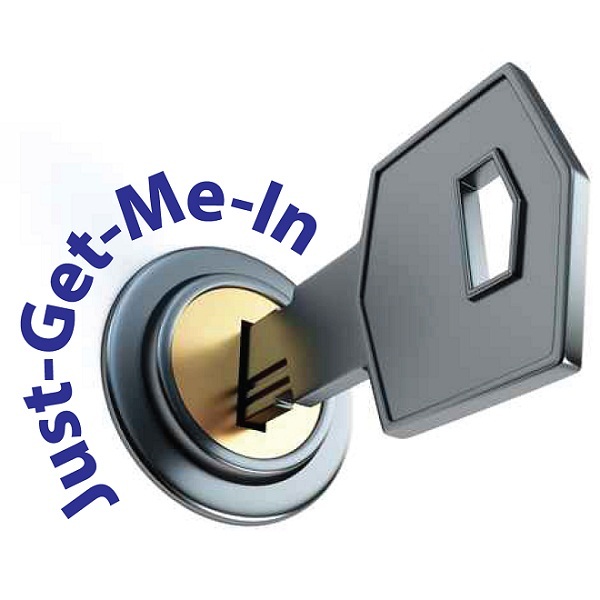 Martyn from Just Get Me In was very chatty and friendly, and very knowledgeable when it came to fixing my lock. Prompt efficient service and helpful advice. I called at 9.45am Martyn came at 10.10am and replaced the window lock and also explained how to tighten up loose locks on other windows. Excellent service at a reasonable price! Good job well done, in a professional manner. A great guy always on time and always fixes the problem. Many thanks. Very helpful and obliging - did the job no fuss, no mess and at a time convenient to me. Martin was prompt, personable and professional. We had ordered a 3 piece suite which had arrived and found we had lost the key to the French doors which was the only viable access for the furniture. Despite it being an older door, he was able to unpick it, put on a new barrel and suggest security measures as well. Lovely man. Even helped to put in the furniture! Fantastic job! We moved house recently and found that we had no keys to the UPVC windows. Contacted Martyn late pm and he arrived promptly next am - took very little time to identify required keys from his set of masters and even ordered them himself and brought them to us a few days later. Mentioned in passing that one of our uPVC doors was hard to close and Martyn quickly identified the problem and adjusted and lubricated the mechanism before checking the other door and finding a similar problem. So, original problem sorted and both doors now closing more easily than ever before, all at a very reasonable cost - we cannot recommend this service highly enough.